We’ve said goodbye to a few members of our Retired Retrievers family recently. In the last few weeks, we’ve lost both of our polar bears, Noah and Gus. We’ve lost Lincoln, our yellow lab from South Florida. And just last week we lost Toby, our 14-year old yellow lab who spent most of his life on a chain in rural Georgia. In the not so distant future we also anticipate losing Jake, our ancient three-legged Beagle. Recent x-rays showed a mass on Jake’s liver. We’re doing what we can to keep him comfortable until it’s time to let him go. Every single one of our stories is a success story. It may not always feel like that, but it’s true. The important thing isn’t how much time we have with our dogs. The important thing is how much love and joy we fit into that time. Although we shed tears for each and every dog we lose, we also recognize the beauty in a community of animal lovers coming together to pick up the pieces and mend a dog’s broken heart after someone else has failed them. Because of our Retired Retrievers family – especially our fosters, adopters, and donors – our dogs don’t die scared and alone in shelters like they would have without our help. Instead, they gently cross the Rainbow Bridge being held by someone who loves them after having experienced the best days, weeks, or months of their lives. And that is why, even when we say goodbye, we consider every story a success story. 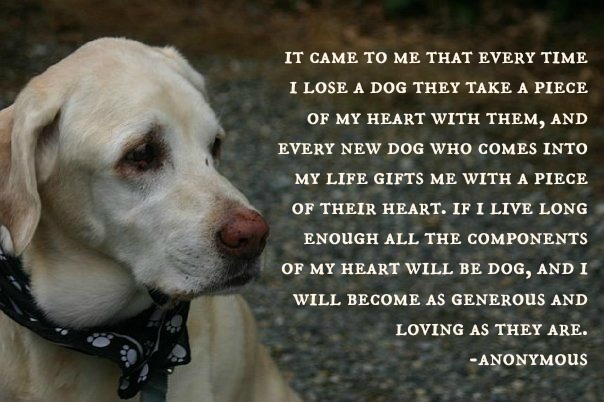 Our dogs cross the Rainbow Bridge knowing that they matter, knowing what it’s like to be part of a family, and knowing what it’s like to love and be loved. We’ll always wish for more time – there will never be enough time – but knowing that we fit as much love and joy as we could into the time we had is all that really matters.